Wouldn’t it be nice to be able to formulate and communicate an organisation’s strategy simply? 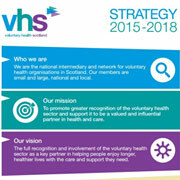 That’s what Voluntary Health Scotland have achieved with their recently launched strategic plan for 2015-18, available here. It was a real pleasure to facilitate the process with VHS’s staff and board, and to contribute to the content and design of such a useful document. Although strategic planning processes are rarely straightforward, the goal here was always clear: to create a focused, visually appealing strategic plan that lets stakeholders know what the organisation is all about. VHS’s own comments can be read on our testimonial page. Can you help us improve the ‘Lasting Difference’ resource?